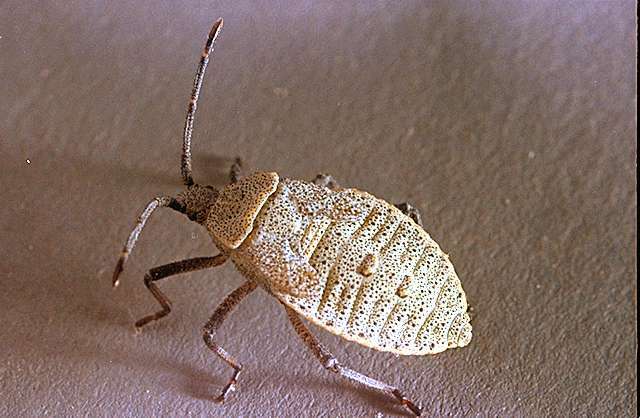 Pest description and crop damage The squash bug attacks squash, pumpkin, melons, and related crops. Adults are typically dark brown, but may have gray or light brown markings. They are about 0.75 inch long at maturity. Squash bug nymphs and adults feed on the leaves, causing small yellow specks which later turn brown. Squash bugs also inject a toxin into vines, which causes a wilt from the point of attack to the end of the vine. Affected runners wilt and turn black and crisp. Small plants may be killed, while larger plants may lose several runners. 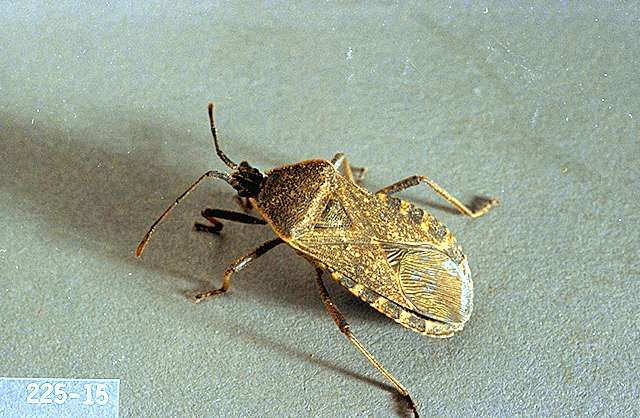 Squash bugs also may attack young fruit. Biology and life history Adult squash bugs overwinter in debris and sheltered places in the garden. Brown to reddish eggs are laid along the veins of new leaves. The newly hatched nymphs (immature bugs) are greenish to gray. Clean up debris in the fall to remove overwintering squash bugs. 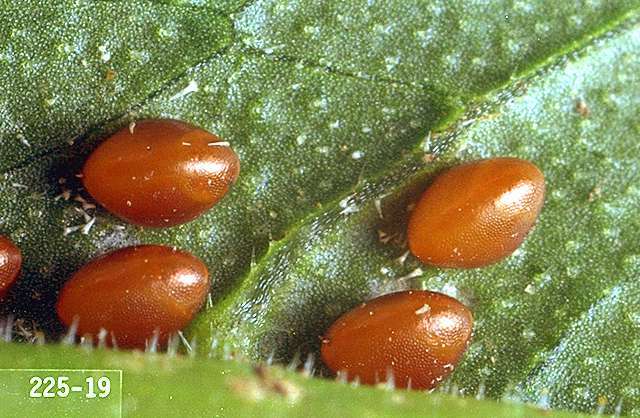 Hand-pick eggs, nymphs, and adults. acetamiprid (Assail 30SG) at 0.1 lb ai/a. PHI 0 days. REI 12 hr. Retreatment interval 5 days. Do not exceed 5 applications or 0.5 lb ai/a per season. alpha-cypermethrin (Fastac EC) at 0.0175 to 0.025 lb ai/a. PHI 1 day. REI 12 hr. Retreatment interval 7 days. Do not exceed 0.075 lb ai/a per season. bifenthrin (Brigade WSB, Sniper) at 0.05 to 0.1 lb ai/a. PHI 0 days. REI 12 hr. Do not exceed 0.3 lb ai/a per season. Retreatment interval 7 days. Do not exceed 2 treatments after bloom. bifenthrin/avermectin (Athena) at 0.05 to 0.12 lb ai/a. PHI 7 days. REI 12 hr. Retreatment interval 7 days. Do not exceed 0.35 lb ai/a Athena, 0.056 lb ai/a avermectin, or 0.3 lb ai/a bifenthrin per season. bifenthrin/zeta-cypermethrin (Hero) at 0.04 to 0.1 lb ai/a. PHI 3 days. REI 12 hr. Retreatment interval 7 days. Do not exceed 0.4 lb ai/a per season. Limit 2 treatments after bloom. carbaryl (Sevin 4F) at 1 lb ai/a. PHI 3 days. REI 12 hr. Retreatment interval 7 days. Do not exceed 6 lb ai/a per year. Do not apply to blooms. chlorantraniliprole/thiamethoxam (Voliam Flexi) at 0.1 to 0.174 lb ai/a. PHI 1 day. REI 12 hr. Retreatment interval 5 days. Do not exceed 0.172 lb ai of thiamethoxam or 0.2 lb ai of chlorantraniliprole per acre per growing season. clothianidin (Belay) at 0.05 to 0.067 lb ai/a. PHI 7 days. REI 12 hr. Retreatment interval 10 days. Do not exceed 0.2 lb ai/a per season. dinotefuran (Scorpion 35SL) at 0.05 to 0.18 lb ai/a foliar or 0.23 to 0.27 lb ai/a soil. PHI 1 day foliar; 21 day soil. REI 12 hr. Retreatment interval 7 days. Do not exceed 0.266 lb ai/a foliar or 0.532 lb ai/a soil per season. esfenvalerate (Asana XL) at 0.03 to 0.05 lb ai/a. PHI 3 days. REI 12 hr. Do not exceed 0.25 lb ai/a per year. flupyradifurone (Sivanto 200SL) at 0.14 to 0.18 lb ai/a. PHI 1 day. REI 4 hr. Retreatment interval 7 days. Do not exceed 0.365 lb ai/a per season. gamma cyhalothrin (Declare) at 0.01 to 0.015 lb ai/a. PHI 1 day. REI 24 hr. Retreatment interval 5 days. Do not exceed 0.09 lb ai/a per season. lambda-cyhalothrin/thiamethoxam (Endigo ZC) at 0.064 to 0.072 lb ai/a. PHI 1 day. REI 24 hr. Retreatment interval 5 days. Do not exceed 0.18 lb ai/a lambda-cyhalothrin or 0.172 lb ai/a of thiamethoxam per season. novaluron (Rimon) at 0.078 lb ai/a. PHI 1 day. REI 12 hr. Retreatment interval 14 days. Do not exceed 0.23 lb ai/a per year. tebuconazole/lambda cyhalothrin (Crossover) at 0.14 to 0.16 lb ai/a. PHI 7 days. REI 24 hr. Do not exceed 0.18 lb ai/a lambda cyhalothrin or 0.48 lb ai/a tebuconazole per season. Retreatment interval 10 to 14 days. zeta-cypermethrin (Mustang) at 0.04 to 0.05 lb ai/a. PHI 1 day. REI 12 hr. Do not exceed 0.3 lb ai/a per year. Retreatment interval 7 days. Note: Pesticides can injure cucurbits. Be sure foliage is dry at the time of application.